My day starts before dawn. I love being out on the trail early in the morning as the sun rises. It's a special time, I enjoy hiking the most first thing in the morning. So that means breakfast in the semi-dark pre-dawn light. Granola, instant breakfast and a mocha. I don't ever seem to tire of that breakfast. The trail moves across ridges for the first few miles. Up high, well high for here, about five thousand feet. Views off in directions depending on which turn I'm on. I can see the trail for miles and it seems like forever before I arrive there. It's a steep looking exposed spot. Like the trail goes across the face of a cliff. When I get there I find it does. It's a whole lot less dangerous than it looked from far off. It's still cool with great views off to the southeast. After that the trail goes through Bartle Gap and heads down. Down all the way to the McCloud River. Ten miles of easy forest walking downhill. Shady cool, smooth trail, not a lot of rocks to trip on. There's water every few miles. 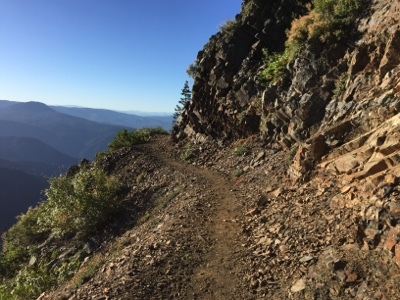 It is a beautiful part of the PCT. Some of the trees are just massive. Giant old growth Douglas fir trees. I had no idea that this forest was this beautiful and this untainted. It's remote and doesn't get a lot of visitors. The creeks are flowing with clear clean water. The forest reminds me a lot of the Santa Cruz mountains where I've done a fair bit of day hiking. Very similar plants and climate. Except these trails go on and on without running into a road or any sign of civilization. It's wonderful. Down, down, down, eventually making it to the McCloud River. Flowing with water the same color as McCloud Reservoir. A glacier blue color. I'm not sure why it's that color but it's sure beautiful. I sit by the river and eat a peanut butter tortilla. I also drink a bottle of water. So far today I have only carried a liter of water. I stop when thirsty at the next water source and drink a cold bottle of water. I save the water I'm carrying for when there isn't any convienent water source. That might be soon. The afternoon is all uphill away from the McCloud River. I hope to hike eight miles or so and find a camp. This puts me about twenty miles to Castella tomorrow. I climb but without enthusiasm. I climb slowly, slow enough to take in the scenery around me. Slow enough to not trip on the occasional rock or root embedded in the trail. Slow enough to enjoy myself. At least as much as I can hiking uphill, in the heat. The highest point is just a little over three thousand feet. Meaning it'll probably be pretty warm tonight. This section is the poison oak gauntlet. I find that I have to not only look for rocks and roots on the trail I also have to pay attention to anything green. There is poison oak everywhere. On both sides of the trail hanging down from above. There are other plants too. So it's constantly having to decide if I can push a branch out of the way or duck around it. There are so many different types of plants too. Poison oak has a way of morphing slightly to its surroundings. Shiny leaves, dull leaves, small leaves, big leaves. Tall thin wispy stalks with a few leaves. Short bushes with light colored leaves. The variations seem infinite. My slow walking gets even slower as I stop to identify plant from plant. I can only imagine Thru-hikers who don't recognize poison oak speeding through here and getting a pretty severe case. I guess I'll see on the other side. I make it to camp. It's close to water so I get enough for dinner and breakfast. I make dinner sitting on a log. I notice that mosquitos are paying me too much attention so I lather on my insect repellent. Problem solved. I'm wearing a cloaking device. I enjoy my Split Pea Soup in peace. Oolong shows up about the time I finish. He's camping here too. He's just swarmed with mosquitos. He, like most Thru-hikers I've met, doesn't use DEET. I sure don't understand it. The bugs give him misery until he is able to retreat into his bivy. The water is close enough that I get to listen to water tonight as I go to sleep. One of my favorite sounds in the whole world.